Upper Boat Studios was a television studio complex leased to the BBC in mid-2006, and formerly operated by BBC Wales. 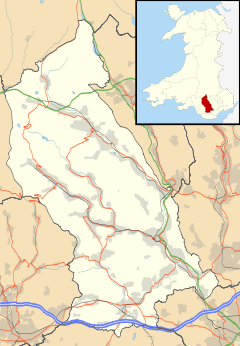 It is located in Upper Boat, a village on the outskirts of Pontypridd, Rhondda Cynon Taf, near Cardiff in Wales. The studios, previously a seat belt manufacturing factory for the automotive industry, were officially opened on 27 July 2006; 12 years ago (2006-07-27), by Welsh Enterprise Minister Andrew Davies, for the purpose of producing Doctor Who, along with its related spin-off programmes. At ten times larger than BBC Wales existing site at Llandaff, the Doctor Who residency at Upper Boat Studios included the use of its six sound stages. Other facilities at Upper Boat included a large props store, workshops, and video editing suites. ^ a b c d e f g h i j k l m n o "Current BBC production studios outside London > Roath Lock - Cardiff". TVStudioHistory.co.uk. Martin Kempton - History of British television studios. Retrieved 1 June 2017. ^ a b c d e f "BBC Studios". DoctorWhoLocations.net. Doctor Who Locations Guide. Retrieved 29 May 2017. ^ a b c d e f g h i j Nick Dermody (27 July 2006). "Time Lord handed permanent home". BBC.co.uk. BBC Wales at BBC News. Retrieved 1 June 2017. ^ "Last day of Doctor Who filming at Upper Boat..." Edward Russell. Twitter. 11 May 2012. Retrieved 29 May 2017. ^ "Still at Upper Boat Studios". Sherlockology. Twitter. 29 May 2017. Retrieved 29 May 2017. ^ "Work starts on BBC Wales drama village in Cardiff Bay". BBC.co.uk. BBC News. 24 June 2010. Retrieved 29 May 2017. ^ a b Maggie Brown (3 December 2010). "Upstairs, Downstairs: the return of a classic". TheStage.co.uk. The Stage, The Stage Media Company Limited. Retrieved 30 May 2017.